Gove is another Rio Tinto bauxite mining site, but quite different from the operation on the other side of the Gulf. 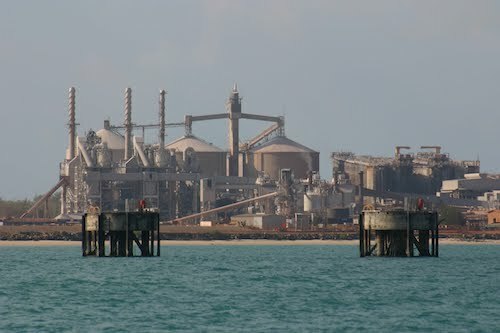 Whereas the town of Weipa was purpose-built in the wilderness to service the mine, there were already existing settlements on the Gove peninsula when the miners came so they had to fit in around what was already there. 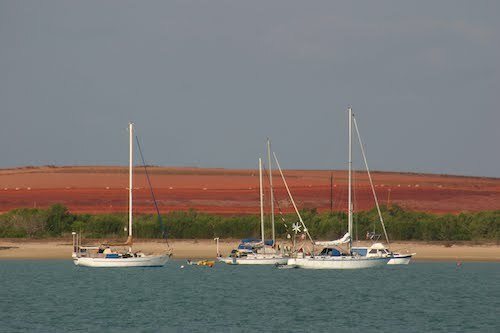 Around the harbour itself are situated the Rio Tinto Alcan bauxite refinery and alumina loader, the Perkins delivery barge terminal, fields of sodium hydroxide tailings, and the Gove Yacht Club. Everything else is in Nhulunbuy Township a dozen kilometres down the road. The yacht club gave us a warm welcome, and for a few dollars we purchased temporary membership which gave us access to a shower block and laundry, as well as a key to get in the back door of the pub which was handy when the front door was locked against drunken and screaming aboriginals, an all too frequent occurrence. The clientele of the club was a mix of aboriginal drinkers from the dry townships down the road, visting yachties like ourselves, and workers at for Rio Tinto who chose to live aboard rather than in town. The harbour contained quite a few wrecks of old liveaboard boats that had sunk when their tenant moved on to another mining contract. The taxi service from the yacht club into Nhulunbuy was enormously expensive, so by far the best way to get there was to hire a car for the day. The cheapest service was run by local resident Manny (08 8987 2300) who charged us fifty dollars for the day’s use of a decent Hilux Twin-Cab, immediately saving us money over the cost of a taxi each way. The ute enabled us to provision, although not to buy alcohol because the township is dry and you need a special license just to buy it from the supermarket. One of the recurrent conversational themes at the club was how difficult it was to get fuel from the Perkins barge dock. Not only was it tricky to manoeuver in and out, but there were quite a few tales about how reluctant they were to service yachts at all. We threw some fuel cans into the back of the ute and filled up at the service station in town. Nhulunbuy had little character and could be described as a number of houses of various sizes scattered around some small apartment blocks. There were a couple of small and run-down malls offering a supermarket and take-away food, a bank, a few clothing stores and a post office. The civic pride that was so obvious in Weipa was missing here, and the streets were lined with discarded junk. Since we had a car, we braved the “no entry without a permit” signs to visit the art gallery in neighbouring Yrrkala. The gallery was interesting, and so was the museum of artifacts and the photographic record of the conscripted aboriginal forces in WW2, but the gallery prices seemed to us to be rather high. It didn’t seem to hurt their business, though, because the building was scattered with brand new computer equipment and bark and wood paintings that had been packaged up for delivery to satisfied customers. We spent several evenings at the yacht club and met a lot of interesting people. A bunch of backpackers had recently been abandoned there after crewing for a yacht whos skipper had promised them flights back to Perth from Gove. The yacht had sailed off into the sunset leaving them stranded on the beach, and they’d made the best of it by working at the club. Some kind soul had put them up on one of the boats in the harbour. We also met Jan and Neville on Panache and Selina and Stephen on Westward II, as well of course Paul on the ‘big grey cat’ who entertained us with tales of his extraordinary life sailing from place to place. Gerry and Alan gave us a tour of Black Gold, probably the highest-tech power boat in Australia, which can run on practically anything – old sump oil, chip fat, coconut oil – because it has been built around a miniature hydrocarbon cracking refinery and computer controlled blending station. On the outside it looks like a rich man’s plaything. Very impressive indeed. Time passed, and it became clear that Gove is one of those pleasant black holes where your life can slip away in a blur of alcohol and gossip. Some yachts had been there for years. Even the GPS didn’t know what time it was, never really deciding whether we were in Northern Territory or Queensland. The only real irritant were the sandflies. Almost completely invisible, they were always attacking our lower limbs. We tried nets and mosquito coils and sprays and even set off an insect bomb on the boat, but they were completely unstoppable. 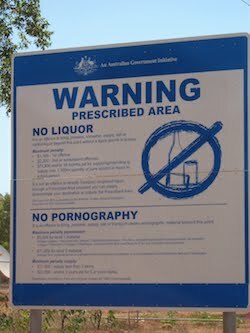 According to the chemist in Nhulunbuy, they weren’t actually biting us, but were peeing on us and their pee is really toxic. Bronwyn was particularly susceptible, and all her sandfly sores turned into violently itchy welts. It’s a feature of aboriginal life that they love to set fire to things. You can always tell if an island on aboriginal land is inhabited because of the enormous pall of greasy smoke that hangs over it, and here on the mainland it was no different. Every piece of bush was continually burning. Even when a roadside verge had already been reduced to stark black sticks, somebody on the way back from the pub would still try to light it. Long term yacht residents talked of weekly deck washes to remove the stray ash, and indeed Pindimara wasn’t looking too clean herself. We woke one morning to find the whole peninsula in flames and the anchorage disappearing into the smoke. We took one last trip to shore to load up with water, hand in our key and say goodbye, then set our sights on destinations westward. This entry was posted in Australia, Oceania, Travel, Voyage of Pindimara and tagged Gulf of Carpentaria, Sail on 2009/09/11 by Reinhard. I feel for you with those sandfly ‘bites’ – I’ve also been told it’s their urine and not a bite – I also suffer badly. The only thing that I’ve found that really works for them is Zambuk (http://www.thesouthafricanshop.com.au/zambuk.html) – I’ve also found it in the odd shop. You can also try pure eucalyptus oil but I don’t find it quite as good. I can always get you some and send it to somewhere along your route – let me know if you’d like me to.